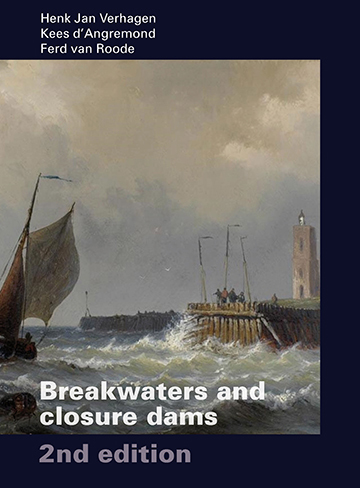 Breakwaters and closure dams belong to the most spectacular hydraulic structures. They are exposed to the most severe loading by waves and currents, either during their construction, or during their life cycle. Design and construction of these structures are that much inter-related that a proper understanding is not possible without a thorough knowledge of theory and a proper understanding of practical matters. This book attempts to offer this combination to the graduate student. It starts with a description of the functional requirements, it discusses the relevant theory and shows the application of experience and theoretical knowledge to the design. Contents: Introduction - Positioning the subject - The design process - Considerations at system level - Use of theory - Data collection - Stability of random placed rock mounds - Dynamic stability - Stability of monolithic breakwaters - Wave-structure interaction - Design practice of breakwater cross-sections - Design practice for closure dams - Construction methods for granular material - Construction methods for monolithic structures - Failure modes and optimization - Flow development in closure gaps - Review - Appendices.